Please visit our website for additional information on the Special Collections Department, Iowa State University Library. What took place at the first Homecoming in 1912? 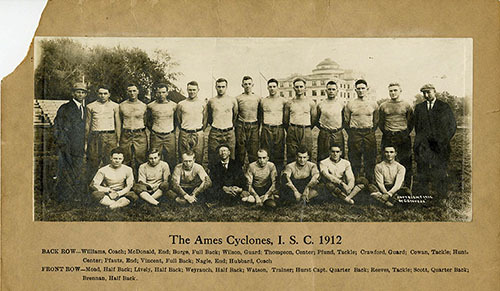 What lead to the football game and the Cyclones being what they were in 1912? What was Iowa State like in 1912? Read below for an answer to all these questions! Above is the is that very first Homecoming football game in 1912 against Iowa. Iowa State's first Homecoming game was November 16, 1912 against our long-standing rival, the University of Iowa. 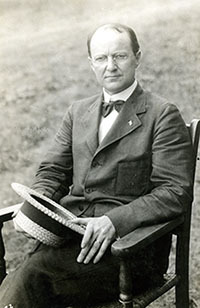 Samuel W. Beyer (in 1912 vice dean of the Division of Engineering and Professor of Geology and Mining Engineering) suggested the idea of Homecoming, and Iowa State (then Iowa State College) seized the idea. Organizers chose the game against Iowa since the rivalry between the schools had made it a popular game for alumni to attend. According to the November 1912 Alumnus, the large number of alumni attending the Iowa games was "on account of the keen rivalry between the two institutions." Homecoming 1912 was celebrated November 15th and 16th, and a holiday was declared for Friday afternoon and Saturday morning by college administrators. Over 150 alumni participated in the 1912 Homecoming festivities. Activities began Friday afternoon with a football game between the freshman and reserve teams. Friday evening there was a “Beat Iowa” pep rally. An open house was held Saturday morning, followed by a reception for alumni and friends in Margaret Hall’s gymnasium (Margaret Hall was a women's dormitory, located about where LeBaron Hall now stands; a picture of Margaret Hall's exterior can be seen to the upper left). After the reception, a luncheon was then held in Margaret Hall, with three hundred and sixty guests attending (the largest number of diners ever served until that time in Margaret Hall). 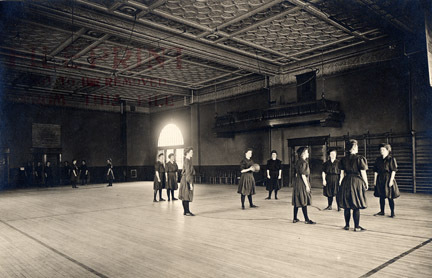 Margaret Hall gymnasium (in 1909) where the 1912 Homecoming luncheon, and other Homecoming activities in the early years, took place. An image of the exterior of Margaret Hall around 1909 can be seen above. The football game took place not at the present Jack Trice Stadium (which was not built until 1975), but rather the old athletic grounds located about where Parks Library stands today. These athletic grounds were referred to as "State Field" (when the athletic grounds were moved to near the new State Gym in 1914, the new fields were often referred to as "New State Field"). Every store in Ames closed its doors for the game from 2 to 4:30pm. The decision was unanimous, even though it was a Saturday afternoon, often one of the busier times for downtown Ames businesses! 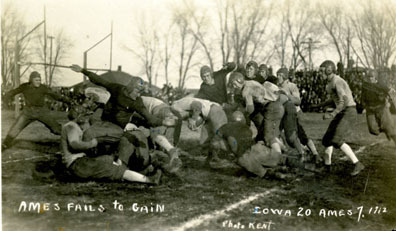 Football practice on the field where the 1912 Homecoming game took place. "The boys had a date with Iowa. Our hopes ran high but pessimists said that the record we had been making was too good to last. That spoiled it all and we were defeated 20-7. Iowa had a backfield, light and extremely light on its feet. Our boys failed to get their plays off in good shape, lacking the snap and vim that characterized their earlier games. Iowa played a clean, hard game, and earned their victory. Hurst played up to standard, while Reeve kept his position corked tight. Hanson and Trickey were towers of strength in the Iowa line." The 1912 Homecoming game would be Coach Clyde Williams' first and last homecoming game as head football coach (he went on to become Iowa State's athletic director). Despite the Homecoming loss, the 1912 football team had a good season, ending 6-1-1, co-champions (with Nebraska) of the Missouri Valley Conference, and state champions of Iowa. Even though Iowa came away with a win (Iowa State 7, Iowa 20), this first Homecoming set traditions for Homecoming festivities in future years. People camped out for hours waiting for tickets, and alumni strolled through campus to see the lawn displays such as "Clean Iowa" and "Sure We Will." And of course there were the "Beat Iowa" signs throughout campus. As Professor Beyer (often called the “patron saint of athletics") stated in the 1912 Alumnus announcement "We hope to make the custom so popular that in future years the number who come back will go far up into the hundreds…We are anxious to make a success of this new venture, because we want our alumni to keep in touch with our athletics as well as other forms of college activity." Since Homecoming is still a solid tradition here at Iowa State, Beyer's wish appears to have come true! 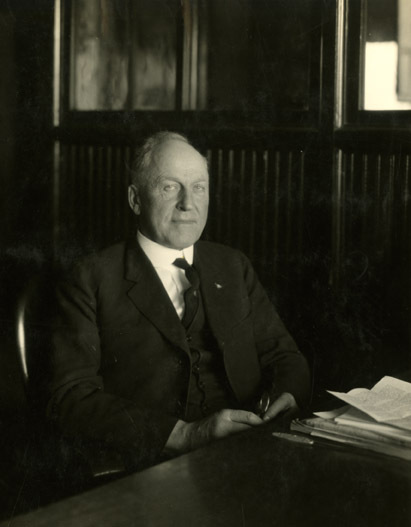 Samuel Beyer, "patron saint" of Iowa State athletics and the man who suggested having a Homecoming in 1912, seated at his desk in 1925. An aerial view of Iowa State College campus around 1910 when a few other universities, and soon Iowa State, were planning their first Homecoming celebrations. Iowa State was not far behind other schools in launching the homecoming tradition. Homecoming refers to the annual tradition at many universities and colleges that celebrates past alumni and residents. University of Missouri's Athletic Director Chester Brewster may have inadvertently coined the term when he invited alumni to "come home" for a rivalry football game in 1911. Traditionally, homecoming occurs after the football team's return from the longest road trip of the season and usually takes place in late September or October. The University of Missouri ("Mizzou") is often seen as the university who hosts a "model homecoming", but it was not the first school to celebrate homecoming. In 1908, Indiana University held their first homecoming (in June). The next year, they changed the date so that homecoming would be held in conjunction with their rivalry football game. Since then, homecoming is held in the fall. Baylor held their first homecoming in 1909, making it the first "traditional" homecoming - complete with a parade, parties, and a football game. The University of Illinois held their first homecoming in 1910, and the next year the University of Missouri held their first homecoming. Many consider this 1910 homecoming as the first real homecoming celebration since it was similar to how most universities celebrate homecoming today. The grand jubilee of college football began humbly on a cold, fall day in New Brunswick, New Jersey. On November 6, 1869, two teams of young ruffians from Princeton and Rutgers met on a barren field to do battle and settle their rivalry. Much to Princeton’s chagrin no doubt, Rutgers won. But little did they know then that they were kicking off what would become one of the most exciting and time honored traditions of college life. It didn’t take long for football to find its way one thousand miles west to Iowa State. The year 1878 saw the arrival of football as a sport on campus, though it was originally organized by students as a recreation club sport. These early years were critical ones for college football, and the game underwent several rules changes. As the game evolved, the popularity of college football boomed. Ames was not immune to the rise in the game’s popularity, the fanaticism growing until football could no longer be contained to student weekend warriors sneaking a game in between their studies. So in 1892, Iowa State officially adopted football as a collegiate sport. The Iowa State College Cardinals were now a real football team. However, the first two years for Iowa State football were uneventful. 1892 saw only two games with a single win and a single loss. 1893 wasn’t much better, with Iowa State playing only three games - all losses. Nonetheless, seeing the trend of football spreading, William Beardshear, the fifth president of Iowa State, led an effort to form an inter-collegiate football association to sanction and recognize the games of area colleges and universities. Beardshear’s efforts paid off in 1894, and in that same season Iowa State finished with six wins and only one loss - one of those wins being against the University of Iowa, sixteen points to their eight. Later that year, a massive summertime tornado destroyed the town of Grinnell, Iowa. Throughout the summer and fall of the following year, in 1895, several more tornados struck rural Iowa viciously once again. As the devastation was fresh in everyone’s mind, the underdog Iowa State Cardinals played Northwestern in Evanstown, Illinois on September 28, 1895. The Cardinals beat Northwestern by an unexpected and tremendous thirty-six to zero point shut-out. Shortly thereafter, the Chicago Tribune headline read “Iowa Cyclone Hits Evanstown,” giving ISU the name still used today: the Iowa State Cyclones. 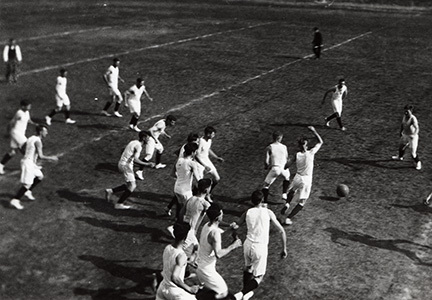 By 1900, football teams had spread to colleges all across America. At the same time though, many colleges were also banning football or refusing to play other teams. Despite the various rule changes, football was still played by brute force, and violence was the name of the game. Student players were routinely seriously injured, and deaths on the field were not uncommon. The violence of football, and the spreading revolt against it by some colleges, eventually led President Theodore Roosevelt to call two separate conferences of college leaders to the White House in 1906. During these conferences, Roosevelt demanded that colleges and universities come to an agreement on new rules to make the game less violent, safer, more strategic, and more sportsmanlike. The school leaders complied and on March 31, 1906, the Inter-Collegiate Athletic Association of the United States (IAAUS) was formed to develop these new rules, including the forward pass. In less than two years, the IAAUS had nearly sixty independent teams, including Iowa State, and three conferences: The Western Conference, the Rocky Mountain Conference and Missouri Valley Intercollege Athletic Association (MVIAA), which together contained over twenty more college teams. The year 1908 found Iowa State joining the MVIAA conference, which had just formed the year before and would eventually become the conference so well known today: the Big 12. The IAAUS turned into the National Collegiate Athletic Association (NCAA) in 1910, and in 1912 the NCAA unveiled new rules that were so revolutionary at the time that this period in sports history is known as the birth of the modern era of football. The new rules allowed for more passing flexibility, gave teams four downs instead of Camp’s original three, touchdowns went from five points each to six points each, the field was finally reduced to its current, and lastly, the kick-off was to be made from the forty yard line rather than midfield. Football in 1912 averaged approximately one hundred plays per game, opposed to today's average of around one hundred and forty plays per game. Similarly, college teams averaged about eight games per season whereas today they play around twelve. Despite the lower amount of playing time though, it was more exhausting to have been a football player in 1912 as there were no offensive and defensive lines: Everyone played both roles, giving the players no breaks during the game. These were critical years for Iowa State football, too. When Iowa State joined the MVIAA in 1908, Clyde Williams had just become Iowa State’s ninth coach the season before. During Williams' tenure, Iowa State saw some of its greatest successes and seasons of most wins. Retiring in 1912, Clyde Williams left Iowa State with a record of thirty-three wins, fifteen losses, and two ties, making Coach Williams' record .694, which up to that time was the best in the college's history. To this day, Clyde Williams is ranked the fifth best coach in wins, and the fourth in percent for Iowa State football history. The entrance to the north side of campus around 1912. Catt Hall (at that time Agricultural Hall) can be seen in the distance. The structure in front of Catt Hall is an addition which has since been removed. The road is approximately where Stange Road is today. What was Iowa State like one hundred years ago at that first Homecoming in 1912? One difference was our name. At that time, Iowa State was known as Iowa State College (ISC). We did not become Iowa State University until 1959. In addition, we were often referred to (and we often referred to ourselves) as "Ames" in order to differentiate us from the University of Iowa. Some buildings on Central Campus such as Beardshear (the Central Building), Morrill Hall, the Campanile, Enrollment Services Center (then Alumni Hall), Marston Hall (then Engineering Hall), and Curtiss Hall (then Agriculture Hall) would be familiar to students today. Other buildings and activities would not be so familiar. Above is the Dinkey, the nickname given to the electric railway described in the 1912 catalog which connected the Iowa State campus to Ames. The image above was taken at the Hub around 1906. 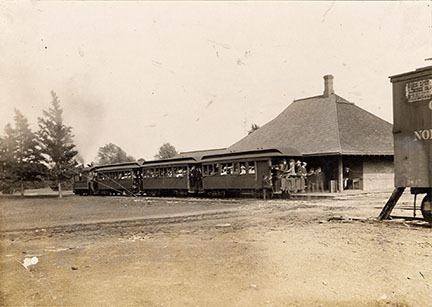 The Hub was commonly called the "Dinkey Station" during the years it served as a depot for the steam railway. Take a look below for a brief glimpse into Iowa State when that first Homecoming took place! The first athletic fields and football stadium was built in 1893, west of Morrill Hall, which is approximately where Parks Library stands today. Fencing and wooden bleachers for the football field were added in 1900. While no formal naming or dedication of the field was given, it was referred to as “State Field”. This was where the 1912 Homecoming football game took place. 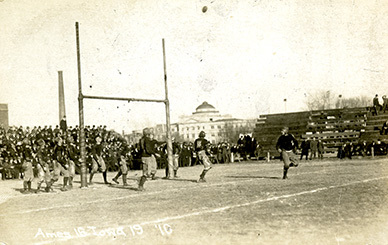 1910 football game against the University of Iowa on the old State Field, located about where Parks Library is today. Beardshear can be seen in the distance. 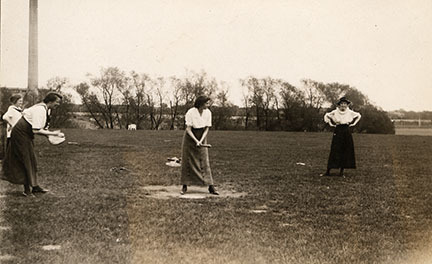 Later, in 1914, the athletic field was moved to the southwest corner of campus, near the Engineering Hall, and it became known as “New State Field”. In the fall of 1938, the field was officially dedicated as “Clyde Williams Field”, and it remained until 1974. Today, the athletic field and football stadium is Jack Trice Stadium. As with our 31,000 students today, this was enormous student growth at the time and there wasn’t enough room in the dorms or in classes to deal with so many students. Edgar Stanton was acting president at the beginning of 1912. Stanton graduated from the Class of 1872, the first graduating class from Iowa State College. Raymond Pearson (seated in chair to the left) was inaugurated as seventh president just a few months before Iowa State's first Homecoming, on September 23, 1912. Pearson was a major advocate of the land grant ideal and may have been the first high profile proponent for making Iowa State College a university. Pearson pointed out that academically we were a university; our admissions and academic standards at the time were as strict as those of an eastern Ivy League institution, and as such, this institution required being recognized as a university. As that battle was one that would not be solved until 20 years after Pearson’s death in 1939 (Iowa State became a university in 1959), Pearson went to work building the college into a university, literally, by initiating many new construction projects, including many of the buildings as well as the roads and sidewalks we are familiar with now. Pearson is known as the progenitor of the school we know today. 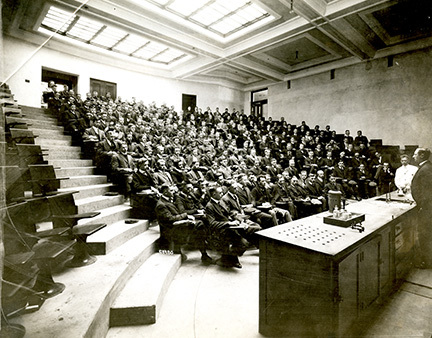 Chemistry lecture hall in Gilman, circa 1910s-1920s. Once a freshman was accepted to Iowa State College, the first 2-3 weeks of their first semester consisted of an assessment of a subject corresponding to a freshman course (ie: English assessment during freshman English class). How well a freshman did on their assessments determined what classes they were allowed to enroll in as sophomores. Class registration was Friday, August 30-31, 1912, from 8 AM until 5 PM. 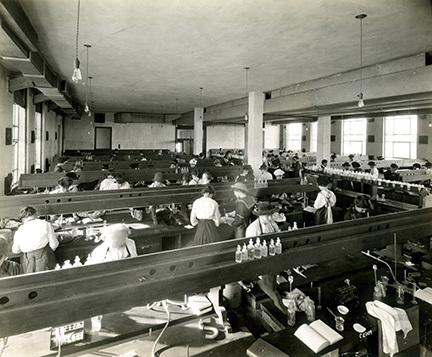 Fall classes began the next Monday, September 2, 1912, at 7:40 AM. Thanksgiving break was only three days, from Thursday, November 28, until Saturday, November 30, 1912. Final exams lasted only two days, from Thursday, December 19, until Friday, December 20, 1912. The fall semester was over December 20, 1912. In order to graduate, a student was required to write a senior thesis. The library contained 35,000 books and 40,000 pamphlets (periodicals). The Engineering department had a library of their own, containing 1,500 volumes. An aerial of campus taken around 1912. Iowa State College received a state standard appropriation of $327,500.00 a special appropriation of $200,000, and an increase of the education fund of $125,000. Room and board was $8.00 to $14.00 per month, depending on the room and amenities. A graduating senior’s diploma cost $5.00. The college book store charged 20% less than retail for all books. There was no tuition for Iowa residents. Out-of-state tuition was $25.00 per semester. Men's intramural soccer around 1912-1913. All students were required to go to a non-denominational chapel service every day at 9:40 AM, and every Sunday at 10:45 AM. Students and faculty would face consequences for missing a certain number of services in a semester. All male students were required to participate in military drill. The Cardinal Guild, the predecessor of the Government of the Student Body, adopted rules abolishing hazing of incoming freshmen, and formed various welcoming committees. The Cardinal Guild approved a rule banning smoking on campus. After effectively being banned in 1894, the Greek system had recently been reinstated on the basis that they mandate and enforce high academic standards. As the Greek system was allowed at Iowa State once more, this period saw the reopening of former houses, such as Delta Delta Delta in 1912, which was originally established in 1889, as well as the opening of new houses. The Vet Med building, now Lagomarcino, was completed to the tune of $175,000. State Gym was in the process of being built. Project cost was $160,000. New roads and sidewalks, many of which exist today, were in a constant state of construction. The library had grown and was moved out of Morrill and into Central Hall, now Beardshear, until a new library building could be built. A major occurence which started just before the first Homecoming at Iowa State was what would eventually become known as "Keep the Girls in Ames". On Wednesday, October 9, 1912, the Iowa Board of Education met in Cedar Rapids and made a decision that was posed to change the future and eventual history of Iowa State dramatically. It was decided by the Board that all non-engineering and general science courses would be moved to what we now know as the University of Iowa (while its official name is still what the university was known as in 1912, the State University of Iowa), beginning the following academic year, in 1913. As a result, all three hundred and thirty-seven women enrolled in the domestic and general science programs at ISC would be sent away forever. 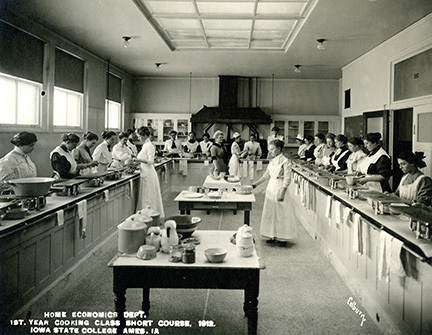 A 1912 first year cooking class short course in the Home Economics Department. 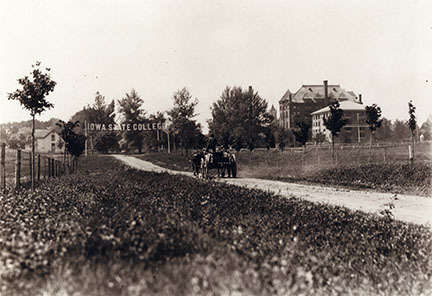 From the humble beginnings of Iowa State, first as the Iowa Agricultural College and Model Farm in 1858, then as the Iowa Agricultural College in 1864 after the Morrill Act was adopted two years earlier, the progressive idea of educating women as well as men was critical to the thinking of our Iowa State predecessors. The very first graduating class of the Iowa Agricultural College in 1872 contained twenty-four men, along with two women. Thus by 1912, the idea of sending our girls away to Iowa City was detestable and insulting, and the Board of Education’s decision kicked off yet another rivalry potentially greater than the first Homecoming game that year, against Iowa. In the early days of higher education in Iowa, the schools we today know as Iowa State University, the University of Iowa, and the University of Northern Iowa, were all separately operated and funded. Amidst growing concerns that the separate operation of the schools produced waste and inefficiency, thus wasting the Iowa taxpayer’s money, Senator William Whipple of Iowa’s 45th District succeeded after a multi-year struggle to pass legislation in the state legislature forming a new Board of Education in 1909. This board would have the task of overseeing all three institutions in order to avoid the pitfalls of inefficiency. Once formed, the Board went to work immediately on the issue of education system management. In their 1910 annual report, the Board announced its intentions to form a committee and do a study on the management and efficiency of the state schools of higher education, in order to put an end to academic rivalry and reduce duplication. Using the results of the study, in April of 1912, Dr. K.C. Babcock with the United States Bureau of Education (now the Department of Education) was hired to form a plan for academic cooperation between Iowa’s colleges and university. Babcock’s plan was then sent by the Board to seven prominent national education experts, including four university presidents. They, along with the Board of Education’s own finance committee, recommended a separation of curricula. Voting on October 8, 1912, the plan was approved, causing a near immediate backlash from the state government, the public, the school administrations, and the students themselves. A 1915 chemistry class for domestic science students. The female students shown above would not have attended Iowa State if the Board's decision had succeeded. The Iowa Board of Education defended its actions by saying that it was fiscally inefficient to duplicate courses of study within the state school system. Further, the colleges—the Iowa State College (now Iowa State University) and the Iowa Teacher’s College (now University of Northern Iowa)—ought to be reserved for the teaching of practical subjects of a vocational design, and that the State University of Iowa (commonly referred to now as the University of Iowa), being the full-fledged university, was logically the liberal arts branch of the Iowa system. Under the Board’s decision, three hundred and thirty-seven Iowa State women were to be kicked out of Ames and sent to Iowa City. Similarly, all work above the sophomore level at the Iowa Teacher’s College (UNI) was to likewise be transferred to the State University (U of I). 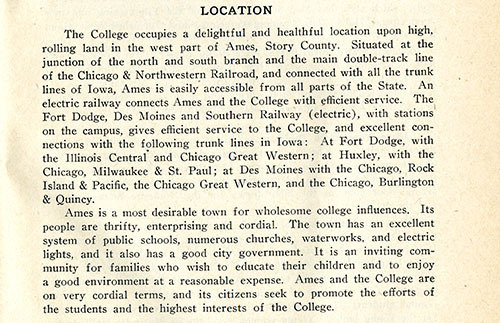 In return, the entire College of Applied Sciences at the State University was to be sent here, to Ames, bringing us 170 engineering students from Iowa City. The night after the Board’s vote, on Thursday, October 10, 1912, once the word had reached Iowa State about what had happened, each of the three hundred and thirty-seven affected girls met in the College Chapel, at the time located in Morrill Hall, and rallied against the decision. Many impromptu speeches were given denouncing the board, and through it all, eventually a plan was hashed out regarding how to fight the decision in the legislature. Simultaneously, the agriculture and engineering students here had separate meetings to plan to fight for the girls on their own. One hundred and fifty male students from the College of Agriculture alone signed a petition that same evening, and the next day petitions were seen flying between the hands of students everywhere across Iowa State’s campus. Consequently, the petitions were collected by the students and delivered to the Board of Education’s meeting the following Thursday, October 17, 1912. All three hundred and thirty-seven girls affected at Iowa State told the Board that they had no intention of moving to Iowa City, and that if the Board’s decision wasn’t rescinded, they would either go back home and not finish, or go to some other school of their own choosing, including many out of state. It was pledged that should the Board fail to take back the decision, that every effort to lobby the state legislature and block appropriations for all schools would be made, effectively holding the Board financially hostage. The photograph above is labeled "ISC Girls", and was taken in 1913 in front of Margaret Hall, the women's dormitory. These are the female students who would have been affected by the Board's decision. The Iowa public was behind the students as well. In the Des Moines Register alone, 111 articles, editorials and letters were published in a six month period following the Board’s decision denouncing it and asking them to change their minds. The college media responded in similar fashion, with the Iowa State Student (now the Iowa State Daily), the Iowa Agriculturalist (the publication of the College of Agriculture), the Iowa Engineer (the publication of the College of Engineering), The Alumnus (the publication of the Iowa State Alumni Association), and a host of others, all published articles and editorials arguing for Iowa State’s girls to be left alone. The Board of Education’s decision to split the courses between the colleges became the hot button topic of the 1912 election. Every candidate for an Iowa legislature seat was asked if they were for the decision or against it. Once the new legislature was voted in, 1913 became a year of resolutions and bills attempting to command the Board of Education to change its mind. Many resolutions and bills were passed in the Senate and House respectively, and though none of them were passed by both houses of Iowa government to become law, the Board of Education finally got the picture. On April 3, 1913, the Iowa Board of Education rescinded its order to separate the courses of study amongst Iowa’s colleges and its university, effectively ending legislative action and public outcry. The girls of Iowa State were safe. To this day, after what were humble and rocky beginnings for the radical idea at the time of educating women, Iowa State University remains one of the best schools in the nation for equal opportunity education.